The word prompt for the 11th Edition of Smile For The Camera is brothers & sisters. Were they battling brothers, shy little sisters, or was it brother & sister against the world? Our ancestors often had only their siblings for company. Were they best friends or not? Show us that picture that you found with your family photographs or in your collection that shows your rendition of brothers & sisters. My submission is to the right -- it's a picture of my grandfather Franklin Louis Depperman and his brother, my great-uncle Frederick Walter Depperman. Frank is on the left and Freddie is on the right. It was taken in 1923, probably in Joliet, IL but perhaps in Peotone in Will County, IL. Look at the picture. Aren't those sailor suits grand! The buttons and the lace-up boots, as well as the ball my grandfather is holding. I don't know what my great-uncle is holding but it looks like a diploma, or maybe a map? Or maybe just a piece of paper. What I love most about this photo is the boys themselves. My grandfather looks so serious, my uncle so very impish. Also interesting is though they certainly look like it, the boys weren't twins. Well, okay, they were.....kind of. They were actually two members of a set of triplets. They had a sister, Florence, but she died at the age of 6 months. I've wondered at times if Frank and Freddie were actually identical twins instead of fraternal. I know that the family always said when they were boys the two looked very much alike and people had a hard time telling them apart. This picture does seem to lend truth to that statement! I lean toward the fraternal twin camp, though. As they got older, their differences grew more marked. By the time I knew and remembered them, when they were both in their late 50's/early 60's, they didn't seem to look too much alike to me even though so many people who didn't know them all that well still insisted that they did. But then again, I knew them my whole life. What do you think? My memories of my grandfather were varied -- stern at times, then somewhat loving and indulgent at others. I would spend summers at his house when I was 7-9 years old and I loved it! I wish I could say he and I stayed close as I got older but we didn't. I tried to reconnect with him a few times over the years but he was far away and he was the penultimate taciturn German. He died in 2004 and I never got to say goodbye. His brother Fred -- my "Uncle Freddie" -- was another story entirely. He was by far my favorite uncle. His wife (my aunt Elsie) would make fudge and he'd take me to Dunkin' Donuts and White Castle. We'd sit eating Baskin and Robbins ice cream and his belly laugh never ceased to make me happy. He was smiley and jovial and warm and loving in all the ways my grandfather either would not or could not be. He was Yin to my grandfather's Yang. I sure did worship him. He gave me a stuffed bear that I still have to this day and I named him Freddie (I know, I know....not very original!) Fred died in 1984 and I sure do miss him. I miss him still. The memories I have of him are sweet and savory. So were they identical twins? Hm, I think not. They were so very different. And oh yes, before I forget! They were the sons of Franz Herman Depperman (b. 1879 in Germany) and Minna Anna Louise Papstein (b. 1888 in Neu Lobitz, Kreiß Dramburg, Hinterpommern, Germany). Franz came to the United States around 1897 and Minna came to the US in 1889. Minna's father August Carl Papstein served in the German calvary and trained Lippanzer stallions to dance for Kaiser Wilhelm I, the King of Prussia from 1861 to 1888. Franz and Minna were married 16 Sep 1904 in Monee, Will Co., IL. They were the parents of seven children -- Anna, Herman, Alvin, Alfred, Franklin, Frederick, and Florence. All lived to adulthood except for Florence and Alvin. Franz died in 1955 and Minna in 1985. Could you imagine having to sit still long enough for all those boot buttons to be fastened? I bet they only wore them for "dressed up" times! Thanks for sharing such a sweet picture! What a totally adorable picture!! I think your comment about Yin and Yang was interesting ~ my sister has twins (a boy and girl so we KNOW they aren't identical!) and we often say that they divided everything up before they were born - you be a boy, I'll be a girl, you be right-handed, I'll be left-handed, you like chocolate, I'll like vanilla. They even managed to be born on different days - right before and right after midnight! 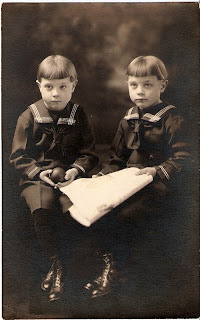 It's my understanding that both boys -- actually all of my great-grandmother's children -- wore those sorts of shoes daily. I know my g-grandmother did. Children were to be clean and polite and quiet at ALL times. Minna was a stickler for propriety and appearances and was the ruler of the roost, that's for sure! I love that comment about even being born on different days! What a unique story your niece and nephew can tell about their birth. Hi Diana. I love the picture of your grandfather and great-uncle Frank! I think they look identical. But if there was a third and a girl, maybe they weren't. My mother was a twin, identical in appearance, but very different in personality. Your post is very interesting. Made them come alive. Thanks so much. Your photograph and article are a great inspiration to record one's memories of people, not just the facts about their lives. Thank you.